If your battery is low and you require your device to be active, later don’t turn your battery on. 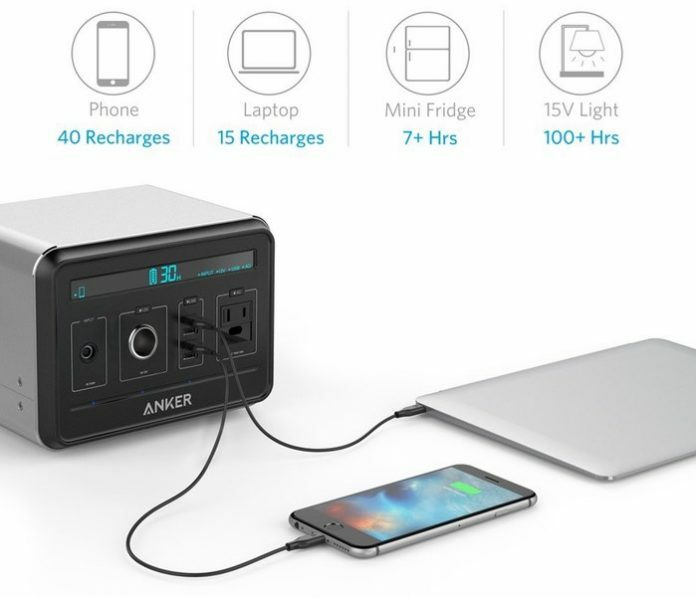 Just Turn to Anker’s Massive Power House 400Wh/ 120600 mAh (milliampere-hour) that lasts your battery life in case of Mobile (40 Recharges), Laptop (15 Recharges), Mini Fridge (7Hrs), a 15V Stand light (100Hrs). “You don’t need, but you want.” The Anker PowerHouse weighs 9.3 pounds with dimensions of 7.9 x 6.5 x 5.7 inches. The ultimate portable power supply packs up with 1, 20, 600 mAh battery makes smaller and lighter with Lithium ion battery than lead acid power packs. Usually, the battery pack range in from 2,000 mAh to 20, 000 mAh, which can recharge a smartphone between 1 to 5 times, but this new Anker Powerhouse is different from others. It can charge an average phone about 40 times or you could recharge your laptop up to 15 times. The Anker Powerhouse weighs less than 10 pounds and looks like a car battery. The most compact 400Wh Power House is a kind of portable generator alternative which supports AC/ DC Power Inverter. Anker’s Power House pricing $499 and $399 by using code: ANKPower. Pre-order the world’s most advanced 400Wh Portable Power Supply available only at Amazon and it will be in stock on May 22, 2016. It offers a TRIPLE output mode with an AC 12V socket, an AC outlet, and 4 USB ports and also an eco-friendly power supply i.e. fumeless, fuel-less, and gives safe and silent power. Anker powerhouse recharges 10Hrs if in the case of a wall outlet, 16Hrs in the case of direct solar sunlight. Powerhouse safeguards with BMS (Battery Management System) which supplies safety procedure like voltage control, temperature control, preventing short circuit. Anker values their customers and their feedback all within eighteen-month warranty and easy reach support. Previous articleWill Apple Music service shut down Spotify in Near Future?